I met Aramis yesterday. He is a young but perfectly formed F2 Savannah cat who was about to go to a new home. Actually, he is not quite perfect for a Savannah cat; his tail is too long. It looks great though from a photographic point of view. It is also difficult to get a sense of scale in the photos that I took – he is small as he is a very young cat. He was bred and raised by Martin and Kathrin Stucki of A1 Savannahs, Ponca City, Oklahoma. Well, he is a special boy cat. He is very loving and very active. Although I didn’t see it he can apparently charge at a wall and leap on it running across it and then jumping off. I am talking about vertical walls and Aramis is running on the vertical bit! The pictures were taken at the home of Martin and Kathrin. There really are some wonderful cats here. And plenty of other animals. Feb 09, 2011 a couple cuties you have there! aaahhhh such a cute litte guy! He could teach sunday school lessons with such a bright face 🙂 The baby coyote is a little butter-ball too. Sooo cute cute cute!! Ooooh!!! I LOVE Servals! And he is such a beautiful little boy!!! Is he a breeding Serval? You’re so lucky to have met Servals, they’re my favourite wild cat, I’d just love to meet one some day too. Before I bought my Savannah I did a lot of research on that breed. Having breed Bengals before I thought the two breeds would have a lot in common. As for A-1 Savannahs my breeder that I bought my Arora from has a female that he purchased from them. She is beautiful. They said her attitude wasnt all that great at first but she has calmed down and I have touched her so I can vouch for that fact. She is an F-3. I know they are very pickey who they sell their kittens to and to see one is by apt. only. I understand their cattery is beautiful, and this is from someone who has been there. I think certain comments should not be made by people who dont have all their information. They are one of the largest breeders of Savannahs in the country. They have a good reputation and my breeder claimed he would be willing to purchase from them again. My kitten is an F-6. She is very sweet. However the first one we purchased wasnt. My advice to anyone who wants to purchase a Savannah is to visit it several times and handle it. Not all breeders will be as accomodating as the one I bought mine from who let us exchange the first one for Arora. 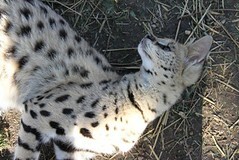 Yes, I have played with servals here. There are 12 here and some are domesticated. One of them is more gentle and predictable than the average domestic cat. Ah, I see. I should have known not to believe rumours, I can’t go against what’s been seen first hand. I can tell you’re enjoying yourself, I apologise for my prior comment. Out of interest, have you met any Servals yet? And do you think you could ask what’s with the hold up of SVs here in Australia? Hehe. Hi guys…Maggie, Martin and Kathryn Stucki own and run A1 Savannahs and I am staying in their guest house. They are wonderful hosts and fine people in my considered opinion. They care for animals. Just this evening no more than 15 mins ago Kathryn drove out her way to pick up a hurt humming bird to nurse it to health. Someone had found it and thought it was hurt. She called Kathryn and Kathryn immediately went to pick it up. People around here bring sick animals to her to be healed and released. Pretty good, I think. A1 Savannahs is no a kitten mill, far from it. I have seen the operation first hand. It is the opposite but yes they are cat breeders. Thanks for the comments. I might disagree but I respect other views. As for A1 Savannahs, I wouldn’t trust them, they’re just as bad as a kitten mill, and so is Select Exotics. Hi Michael,it looks a nice place you are staying, judging by the photo. Poor little coyote,I hope he survives OK.